Turkish food is without a doubt one of my favourite cuisines – they’ve got the dips, the salads and the grills totally nailed, plus they share my eternal infatuation with aubergine, so for me I always know I’m going to eat well when I go to a Turkish restaurant. And that’s no mean feat I’ll have you know – it’s pretty rare that I go out for dinner and don’t have to worry about there being something Emma-friendly on the menu. We used to go to a certain little Turkish place that my grandpa liked when he was alive, it was nothing fancy, but had a lovely atmosphere and delicious food. I’m pretty boring when it comes to menus; when I find something I like I’ll stick to it, and such is the case with stuffed aubergines (or imam bayildi). I’m obsessed with aubergine, and stuffed with onions, garlic and tomatoes these beauties are a serious contender for what I might choose as my death row meal.These make a seriously scrumptious dinner, I love to have them as a main with some brown rice and greens, but you could make them as a starter or side dish too – they’re a great dinner party staple! Preheat your oven to 180C. 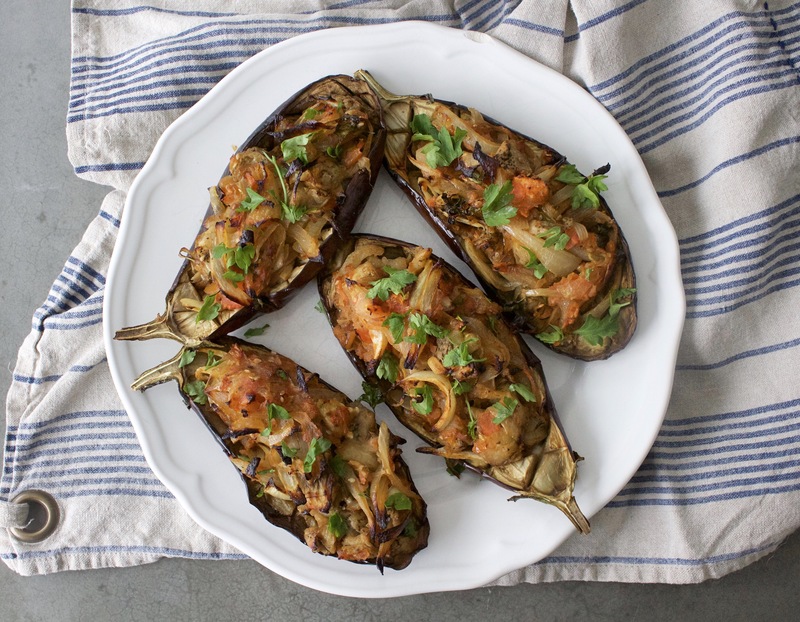 Cut the aubergines in half lengthways and score them deeply with a sharp knife in a criss-cross pattern. Then drizzle them evenly with 4 tbsp of the olive oil, place them on a lined baking tray and bake for 30 mins. Whilst the aubergines are baking, chop the onions finely into slices and place in a frying pan with the rest of the olive oil on a low heat. Chop the garlic finely and add this in, then continue to fry for around 20 minutes until the onions and garlic are golden. Pop the tomatoes in a food processor or blender and whizz for around a minute, then pour this into the frying pan with the zaatar, parsley and any salt and pepper. 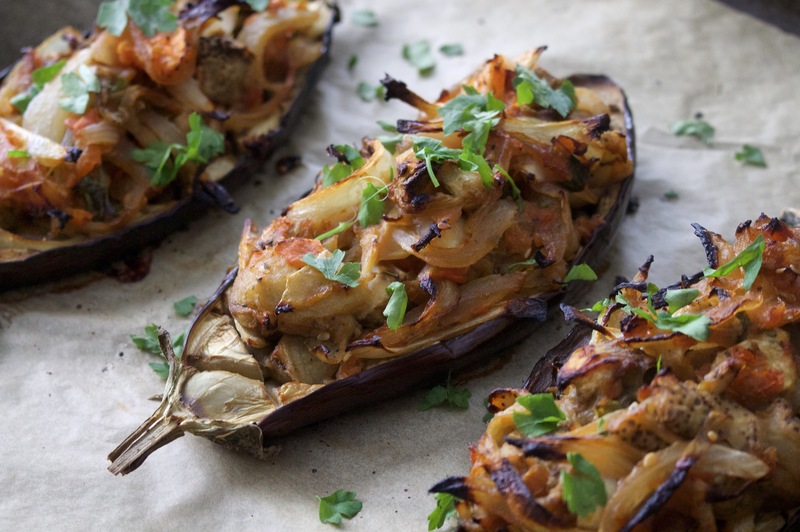 Once the aubergines have finished cooking, remove them from the oven and scoop out the flesh onto a chopping board, leaving the aubergine shells on the baking tray. Chop the insides roughly and add them to the frying pan for another five minutes. Spoon the onion-tomato-aubergine mixture back in to the aubergine halves and place back in the oven for another 20 minutes.